Astronaut and Germanna Descendant Buzz Aldrin walking on the Moon, July 20, 1969. The year 2014 not only marks the 300th anniversary of Germanna in America but July 20, 2014 marks the 45th anniversary of the first moon landing by Apollo 11 astronauts Neil Armstrong and Buzz Aldrin in 1969. 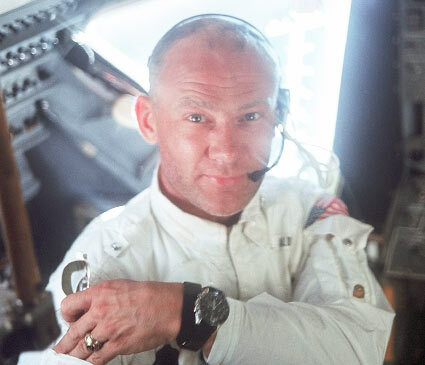 Astronaut and Germanna descendant Edwin “Buzz” Aldrin is a direct descendant of the Rev. Henry Häger, the German Reformed Church pastor at Fort Germanna. On Sunday, July 20, many Germanna descendants attending the 2014 Reunion will be worshiping and taking communion at either Hebron Lutheran Church or Little Fork Episcopal Church. 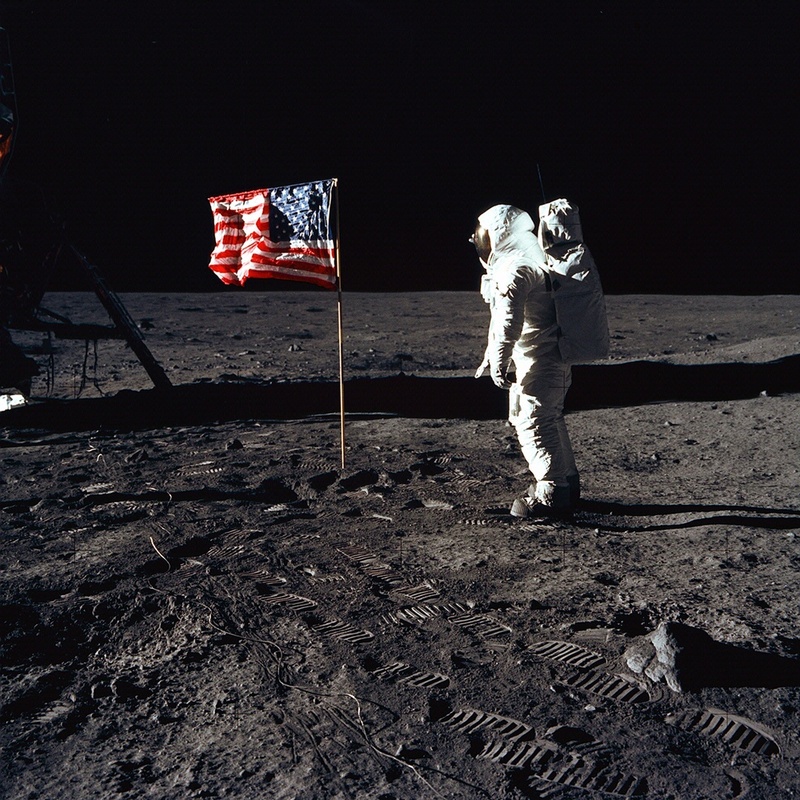 45 years ago that day, Buzz Aldrin also took communion — but on the moon! For several weeks prior to the scheduled lift-off of Apollo 11 back in July, 1969, the pastor of our church, Dean Woodruff, and I had been struggling to find the right symbol for the first lunar landing. We wanted to express our feeling that what man was doing in this mission transcended electronics and computers and rockets. Dean often speaks at our church, Webster Presbyterian, just outside of Houston, about the many meanings of the communion service. “One of the principal symbols,” Dean says, “is that God reveals Himself in the common elements of everyday life.” Traditionally, these elements are bread and wine—common foods in Bible days and typical products of man’s labor. One day while I was at Cape Kennedy working with the sophisticated tools of the space effort, it occurred to me that these tools were the typical elements of life today. I wondered if it might be possible to take communion on the moon, symbolizing the thought that God was revealing Himself there too, as man reached out into the universe. For there are many of us in the NASA program who do trust that what we are doing is part of God’s eternal plan for man. I spoke with Dean about the idea as soon as I returned home, and he was enthusiastic. The next week Dean showed me a graceful silver cup. I hefted it and was pleased to find that it was light enough to take along. Each astronaut is allowed a few personal items on a flight; the wine chalice would be in my personal-preference kit. Dean made special plans for two special communion services at Webster Presbyterian Church. One would be held just prior to my leaving Houston for Cape Kennedy, when I would join the other members in a dedication service. 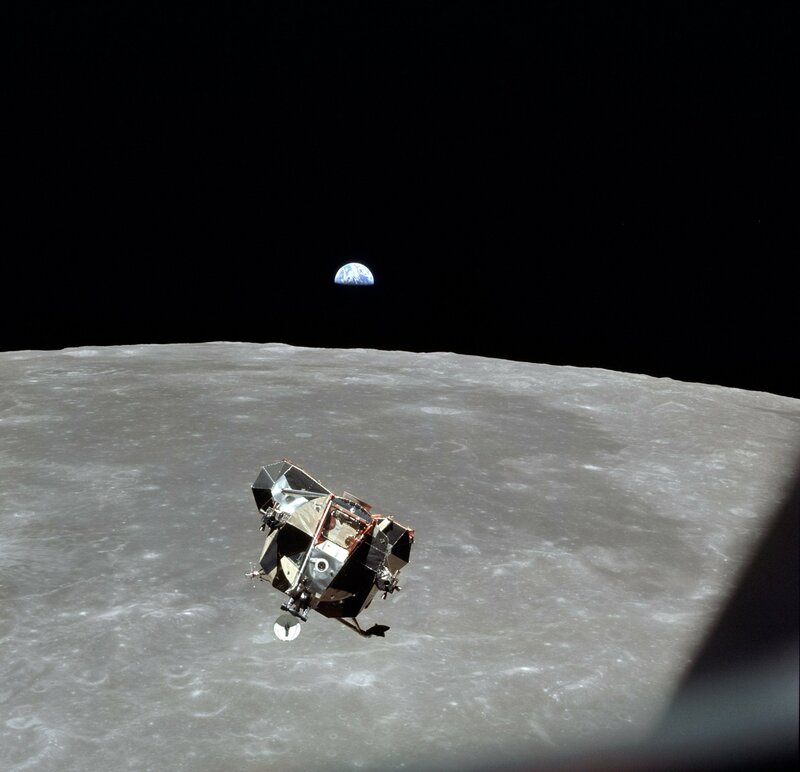 The second would take place two weeks later, Sunday, July 20, when Neil Armstrong and I were scheduled to be on the surface of the moon. On that Sunday the church back home would gather for communion, while I joined them as close as possible to the same hour, taking communion inside the lunar module, all of us meaning to represent in this small way not only our local church but the Church as a whole. Right away a question came up. Was it theologically correct for a layman to serve himself communion under these circumstances? Dean thought so, but to make sure he decided to write the stated clerk of the Presbyterian church’s General Assembly and got back a quick reply that this was permissible. And how much should we talk about our plans? I am naturally rather reticent, but on the other hand I was becoming increasingly convinced that having religious convictions carried with it the responsibility of witnessing to them. Finally we decided we would say nothing about the communion service until after the moonshot. I had a question about which scriptural passage to use. Which reading would best capture what this enterprise meant to us? I thought long about this and came up at last with John 15:5. It seemed to fit perfectly. I wrote the passage on a slip of paper to be carried aboard Eagle along with the communion elements. Dean would read the same passage at the full congregation service held back home that same day. So at last we were set. And then trouble appeared. It was Saturday, just prior to the first of the two communion services. The next day, Neil Armstrong, Mike Collins and I were to depart Houston for Cape Kennedy. We were scheduled for a pre-mission press conference when the flight physician arrived and set up elaborate precautions against crew contamination. We had to wear sterile masks and to talk to the reporters from within a special partition. The doctor was taking no chances. A cold germ, a flu virus, and the whole shot might have to be aborted. I felt I had to tell him about the big church service scheduled for the next morning. When I did, he wasn’t at all happy. It was a possibility. I called the doctor about the smaller service and he agreed, provided there were only a handful of people present. So the next day, Sunday, shortly after the end of the 11 o’clock service my wife, Joan and our oldest boy Mike (the only one of our three children who is as yet a communicant), went to the church. Webster Presbyterian Church replica of Aldrin’s communion cup. There we met Dean, his wife, Floy, and our close family friend Tom Manison, elder of the church and his wife. The seven of us went in to the now-empty sanctuary. On the communion table were two loaves of bread, one for now, the other for two weeks from now. Beside the two loaves were two chalices, one of them the small cup the church was giving me for the service on the moon. We took communion. At the end of the service Dean tore off a corner of the second loaf of bread and handed it to me along with the tiny chalice. Within a few hours I was on my way to Cape Kennedy. What happened there, of course, the whole world knows. The Saturn 5 rocket gave us a rough ride at first, but the rest of the trip was smooth. On the day of the moon landing, we awoke at 5:30 a.m., Houston time. Neil and I separated from Mike Collins in the command module. Our powered descent was right on schedule, and perfect except for one unforeseeable difficulty. The automatic guidance system would have taken Eagle to an area with huge boulders. Neil had to steer Eagle to a more suitable terrain. With only seconds worth of fuel left, we touched down at 3:30 p.m.
Then I called back to Houston. On World Communion Sunday, October 4, 1970, many Christians throughout the world will unite in spirit as they—each in his own church, according to his own tradition—participate in celebrating the Lord’s Supper. For me this meant taking communion. In the radio blackout I opened the little plastic packages which contained bread and wine. I poured the wine into the chalice our church had given me. In the one-sixth gravity of the moon the wine curled slowly and gracefully up the side of the cup. It was interesting to think that the very first liquid ever poured on the moon, and the first food eaten there, were communion elements. And so, just before I partook of the elements, I read the words, which I had chosen to indicate our trust that as man probes into space we are in fact acting in Christ. I sensed especially strongly my unity with our church back home, and with the Church everywhere. I read: “I am the vine, you are the branches. Whoever remains in me, and I in him, will bear much fruit; for you can do nothing without me” (John 15:5). 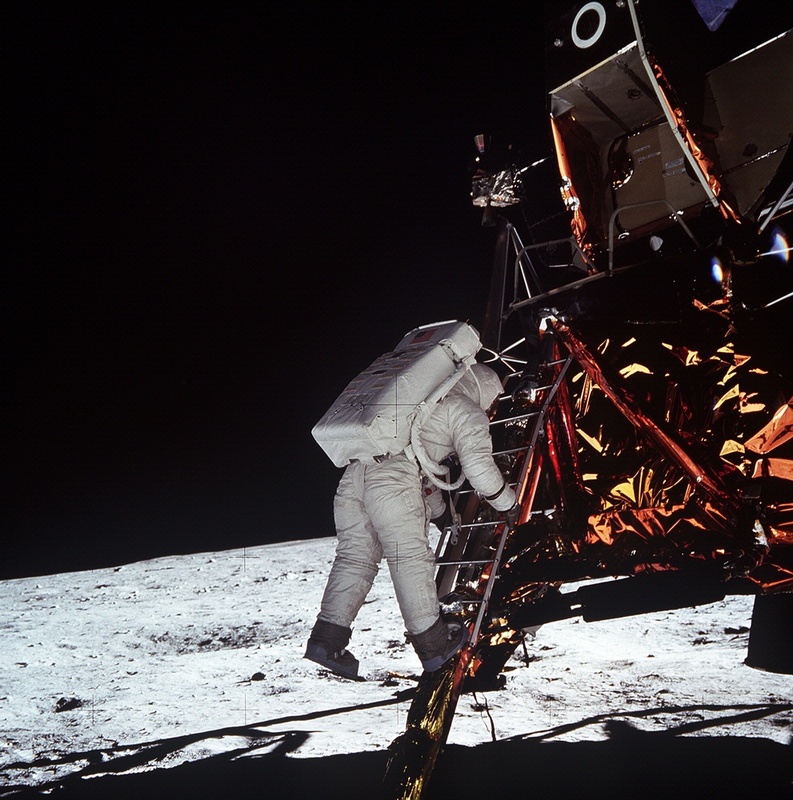 Buzz Aldrin working on the moon with seismic equipment.